Trigger points refer to areas beneath the skin where the muscles have bound together in a way which can reduce the range of motion, cause pain and lower power output. These points can also cause pain elsewhere in the body which is referred to as referral pain. Trigger point massage therapy involves a skilled masseuse finding and releasing these areas of tightness by gradually applying pressure to the tight area in a systematic way, bringing relief from discomfort arising from the site itself as well as referral pain. One of our treatments involves injecting medication (such as corticosteroid or anesthetic) directly into the trigger point to relieve the pain at source, this is known as a trigger point injection and can reduce pain that may radiate from a trigger point to other areas of the body. The shoulder and upper back are common sites for these injections. 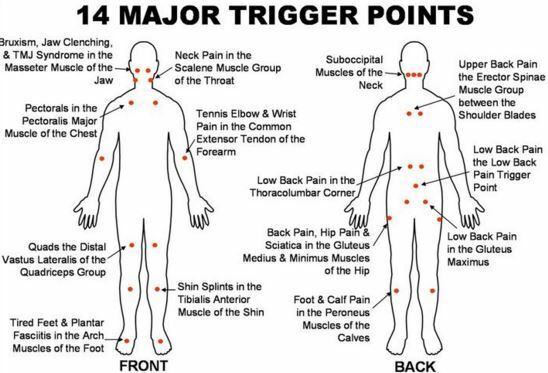 Trigger point injections can be used to radically improve conditions as diverse as as tension headaches, fibromyalgia and myofascial pain syndrome. "Myo" means muscle and "fascia" refers to band so this syndrome involves pain in the tissue covering the muscles. This pain can be caused by repetitive straining such as one might encounter in jobs or hobbies. One way this pain can be managed is via myofascial release therapy. This therapy involves the masseuse gradually applying pressure to the fascia for a period of up to ten minutes, until the tension has subsided. This new and sought after treatment is in demand for athletes seeking to become more functional and injury resistant as well as those seeking relieve from chronic pain. This holistic therapy allows the masseuse to use her intuition and feeling (as well as experience) to sense injuries and can improve the blood flow and lymphatic circulation. Our masseuse will use her in depth knowledge of trigger point maps as well as her practical experience to quickly zone in on the most likely areas of harm. Using this along with your guidance she can usually find problem spots very quickly and get to work right away. Our trigger point therapy reviews are always positive and with this knowledge you can be confident of receiving an effective and professional service. Our customers love our masseuse, one customer raved she was "the best around" and others have found the experience "absolutely fantastic". Our masseuses are incredibly experienced with over 1200 hours experience learning their trade at massage schools, as well as holding a certification from the Therapeutic Massage and Bodywork association for almost 10 years. In summary, Trigger point therapy is a new and exciting treatment that can be incredibly useful for those suffering from tension headaches, fibromyalgia and myofascial pain syndrome as well as referral pain and can relieve discomfort generally in those who have repetitive strain injuries. With this said, why don't you come for a trigger point massage at Elkhart Massage. We know you'll be in a safe pair of hands. ​After a typical day out at work, it is common to experience some muscle pain. For others with more physically demanding work, this pain can be seen more frequently, even grown accustomed to. However, it doesn't have to be near constant. While numerous therapies may help alleviate the symptoms, one therapy to consider would be trigger point therapy. If your pain is based in your muscle that spreads around that part of the body, this therapy can be considered useful. If you experience pain in your back, and the pain is also spread to your head, a trigger point may have been formed. Trigger point pains are often overlooked by your average physician and are noted to be caused by myofascial release, which occurs after an injury has not properly healed. The myofascial is the cover known to cover the inside of the body with the soft tissue known as the fascia. More technically, the myofascial is the soft tissue that covers the muscles. This pain is also known to restrict your range of motion into other parts of your body, such as back pain spreading to the neck. A massage therapist would use a map called a trigger point map to determine the common trigger point. A trigger point therapist may not also be the most affordable or accessible, but this type of pain doesn't disappear overnight. They would be well versed in the source of the pain and would be able to properly refer to the trigger point map to cite the origin. And if you would happen to still experience a burst of pain after a session, a trigger point therapist would be able to pinpoint where the pain had originated and be able to direct you to a proper solution without anyone else's assistance. They could have a personal or work phone used in these cases to reach them after hours. When you are looking for a properly licensed and knowledgeable trigger point therapist, friends and family could be the first step towards locating a proper massage therapist who specializes in trigger point therapy. Contacting your health insurance company would also be a viable solution, as they could have one in your network that gives you discounts or even free services. In some cases, your employer would have some options available to you, like a discount, so if they happen to have a recommended trigger point therapist, be sure to mention it to a supervisor. And if none of these bring up satisfying results, the Internet has a plethora of resources, which would help you filter through your options. be sure to always filter through your reviews, as they can provide both positive and negative answers and give you a list of expectations. Once you have found a massage therapist who has met your criteria, you can discuss your options and see what they can provide for you. Ask about after yours care to see if there is a way to get answers if you experience any pain and want to avoid any additional trips.